After George shows Kramer an interoffice envelope signed by the entire Yankee organization, Kramer thinks George’s wink and sarcastic comment indicate an approval from George for Kramer to sell both the envelope and the birthday card for George Steinbrenner found inside. 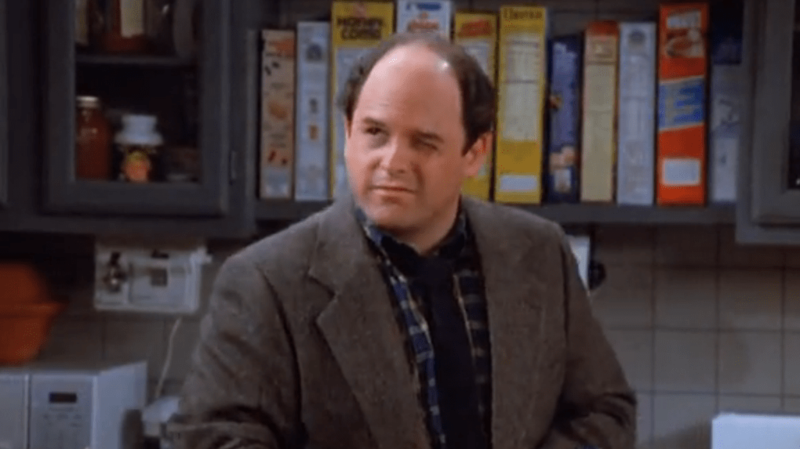 By winking at him, did George make Kramer his legal agent? If not, can George sue Stubbs the memorabilia man to get the card back? An “agent” is someone who is granted legal authority to act on behalf of someone else, i.e. the “principal.” In this case, George would be the principal and Kramer would be the agent. The relationship can be made expressly, like in a written contract, or it can be impliedly created through verbal acts, like when Kramer shrewdly says that George told him to sell the card “not in so many words but I believe we had an understanding.” In general, all that has to happen in order to create a proper agency relationship, is that the principal must manifest some kind of intent to grant authority to the agent for the agent to act on the principal’s behalf and, in return, the agent must manifest some kind of consent to become the principal’s agent. Once this relationship is created, the principal will be bound by anything the agent does that is within the scope of the authority the principal granted to the agent. Therefore, if Kramer did become George’s legal agent to sell the card to Stubbs, then George would have no legal recourse to get the card back. So when George told Kramer “yeah, like I’m going to risk my job with the New York Yankees to make a few extra bucks” and then winked at him, did that manifest an intent to grant legal authority to Kramer? The legal standard for manifestation of intent is less than what is needed for actual intent. All the principal must do is act in a way that shows they want to form the agency relationship, but it is not necessary to possess the actual intent to create the relationship. The creation of an agency relationship is subject to analysis under both the subjective and objective standard. This means that the agent must have subjectively thought that the principal wanted to form this kind of a relationship, and that an outside observer could also reasonably, objectively conclude that the principal wanted to create this relationship. It’s safe to say that Kramer subjectively thought George wanted him to selll the card, but George certainly doesn’t think he gave Kramer that impression. But would a wink and a sarcastic comment make the reasonable person think George wanted them to sell the card? We at Seinfeldlaw do not think this would constitute enough to create a binding agency relationship. However, this would be a fact finding question for a jury to decide whether George manifested the intent to be bound. Since it doesn’t have to be expressly given, it is certainly possible that Kramer did become George’s agent. If Kramer did become George’s agent, then he would have the legal power to act on behalf of George under either the actual or apparent authority given to him. Here, Kramer would have the actual authority to sell the card, since that’s what George “told him to do.” However, if Kramer wasn’t acting as George’s agent when he sold the card then there could be serious consequences for him. While he likely would not face criminal liability since he did not intend to steal from George, he could be civilay liable to George for damages. The question of whether Stubbs would have to return the card to George would be analyzed under the equitable theory of estoppel. This theory is designed to ensure that 3rd parties don’t suffer damages if they acted reasonably under the circumstances. Since Stubbs had no idea that Kramer did not actually have authority, it is possible that Stubbs would be allowed to keep the card, and that only Kramer could be liable to George. Just a thought, if the jury found in George’s favor, wouldn’t that make the letter stolen property thus nullifying the transfer to Stubbs and obligating him to return it to George? Yes! Great call. That would likely apply to Bobby as well. Thanks for reading and commenting!